A 2.5m x 6m (8.5ft x 20ft approx.) Polydome Tunnel which we built recently during the Indian Summer. A Polytunnel is a low cost way of covering a large area but it also has practical advantages – for example being completely safe. Polythene has come a long way over the years – while we guarantee our 900 gauge cover (which maximises durability and light transmission) for 6 years we have had many customers achieve life spans of more than 10 years – some even 12 to 15 years and believe it or not the longest life for one of our polythene covers so far is over 20 years. Many things affect the lifespan – you don’t want the polythene too tight or too loose. If you use chemicals that might shorten the life. The main thing affecting the life of the cover is the sun – how many hours of daylight the cover receives. Our 900 gauge polythene is manufactured to include the maximum grade of UV inhibitors the manufacturers offer. We selected this polythene for its mechanical characteristics, it is supple so can be stretched as easily as lighter covers – and being supple it actually is less likely to be damaged during installation. Our 900 gauge film is thermic – providing enhanced growing conditions and is clear as you can see from the photo which we find most customers prefer. We have this cover in sizes from 2.5m wide up to 12m in width on jumbo rolls which we cut to your required length. Wider covers are available but in a lighter gauge (800 gauge). 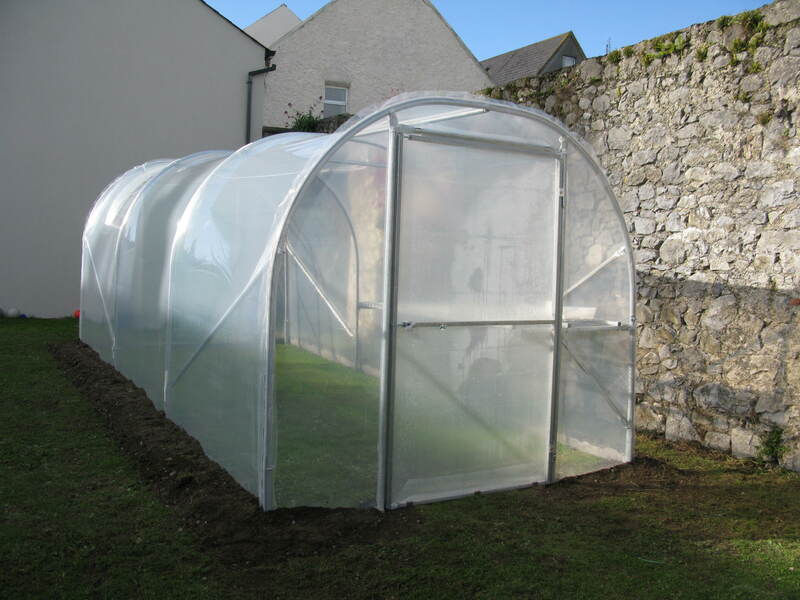 A recent construction we did in Dublin was a 4.5m x 8m Polytunnel. This Polytunnel had ‘side purlins’ fitted which are an optional extra providing extra strength particularly against wind. The customer also ordered a large number of raised beds which we also supply. This Polyunnel also has the optional attractive finish of having the ends of the tunnel without pleating and folding the polythene. This feature is made possible by having an aluminium rail fitted over the end hoop so that a separate cover can be fitted to the gable end (and fixed into the rail over the end hoop as is the polythene on the roof). We are pleased to configure our Tunnels to suit each customer from a wide range of options. Traditionally, people sowed vegetable seeds in their gardens on Saint Patrick’s Day. That was because they were off work and free to do it rather than weather and soil conditions being suitable. But, right enough, the soil is often dry enough to dig and warm enough for seed germination about then. If you have a glasshouse or polytunnel you don’t have to wait for all that. You can sow crop seeds earlier under cover and have plants to put out instead of seeds, gaining several weeks of extra growth. Sow leafy crops like cabbages and lettuce in modules for planting out later, and also a few seeds in the border soil inside to mature early. If you have lots of room, keep one courgette plant growing inside until the outdoor-planted ones start fruiting. You can then chop it out and use the space for something else, but it will have been cropping for weeks by then. Tap-rooted plants such as carrots can’t be transplanted and don’t take kindly to modules, but you can still sow some inside for early crops. Freshly-dug baby carrots, washed instead of peeled, and eaten raw are fit for a king. Seedlings are easiest to raise in a heated propagator. If using it inside the house carry the seedlings out to a glasshouse or tunnel in the propagator with the cover closed to protect them from cold winds as the temperature shock would be too much for them. The sun is getting stronger, so be prepared to open vents or doors on sunny days. But make sure to close them at night! Throw a sheet of bubble-wrap or fleece over plants on frosty nights. I wonder where the greenhouse is! 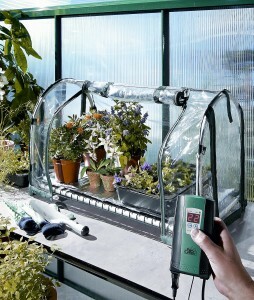 If you haven’t been in your greenhouse for so long that you are asking the above question, that’s okay. You own it, and if you want to take a break from all gardening over the winter, that’s your decision. Maybe next winter you will have green herbs and vegetables and some nice flowers, but what will you do now? It’s time to spring-clean if you didn’t do it in the autumn. On a dry and not too windy day, wash the outside of your glasshouse with a sponge mop and warm water with some washing-up liquid. Hot water might crack the glass, and cold water is too darned uncomfortable when it runs up your sleeve! Work from the ridge down. Plastic tunnels are best left alone, or if badly affected with green algae washed very gently indeed. Tidy up around the greenhouse and renew any gravel or bark mulch. The inside can be done in windy weather without suds blowing in your face, but use a horticultural disinfectant instead of washing-up liquid if pests or diseases have been a problem. Take out all crop remains. Take out all pots and either empty them or tidy the plants up for bringing back in later. Repair the path if needed and dig over the borders, adding in organic matter if you have it (it decomposes faster in the heat of a greenhouse). Wash out empty pots and seed trays with garden disinfectant. Now you’re ready to sow early vegetables such as carrots, ‘Hispi’ cabbage, and salad crops in the greenhouse, and many more for planting outside later. Annual flowers too. Enjoy! Glad to say our Greenhouse Display area is progressing well. We have 9 Glasshouses and 4 Polytunnels up so far with more to come in the coming weeks and months. Our plan will be over time to develop the area to show not only the huge range of Greenhouses and Polytunnels we do but also giving examples of how they can be laid out, which is a question we are often asked by customers. We will also over time kit out many of the Greenhouses and Polytunnels with all sorts of accessories to demonstrate their use, so our display area will not just be for visitors wanting to buy a Glasshouse but a destination for proud owners of Greenhouses wishing to enhance and utilize their investment to its full potential. Our display area is open from 9am to 5.30pm Monday to Saturday (closed for a well deserved break between 1 and 2pm). Why not phone and make an appointment to ensure a specialist for the product you are interested in is available and minimize your waiting time. 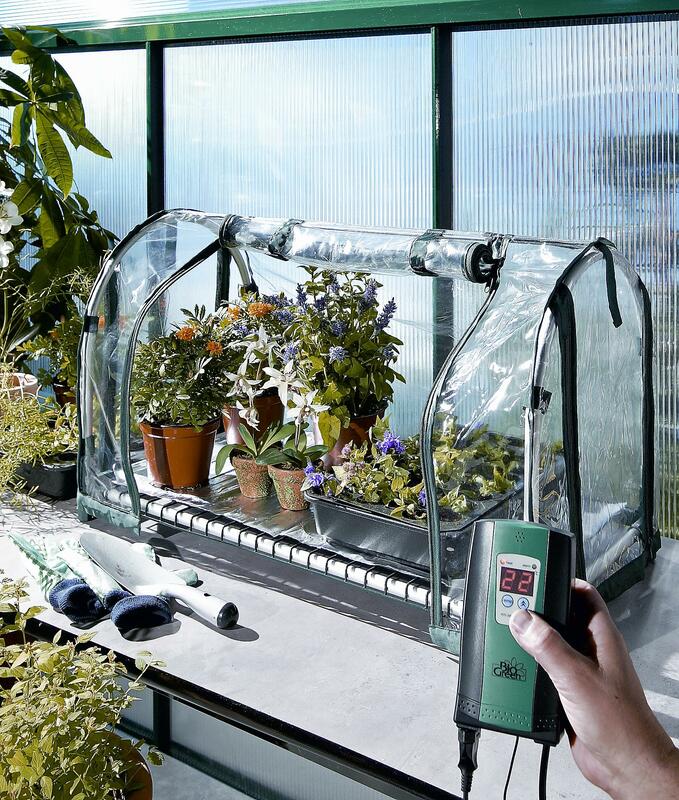 At Polydome Greenhouses we pride ourselves on our expertise in the Polytunnel and Glasshouse industry. We are an Irish Company and have been in business for 27 years. 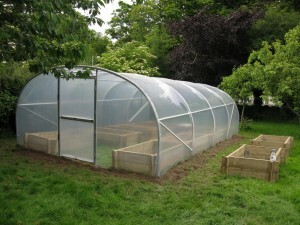 Our Garden Polytunnels are made with High Tensile Galvanized Steel, which is high in strength. 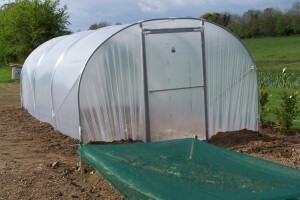 If you are in an exposed area we can configure our Polytunnels to suit your site in a number of ways. Our Garden Tunnels come with straight sides which give the added benefit of more room to work at the edges. Our Garden Polytunnels can also be configured to suit to suit the needs of different customer’s pockets ie: if on a tight budget we have low cost timber doors and lighter polythene available. Our most popular polythene cover is 900 Gauge and comes with a 6 season UV guarantee. It has an anti fog/mist layer and has an EVA layer which provides excellent thermal properties and enhanced growing conditions. 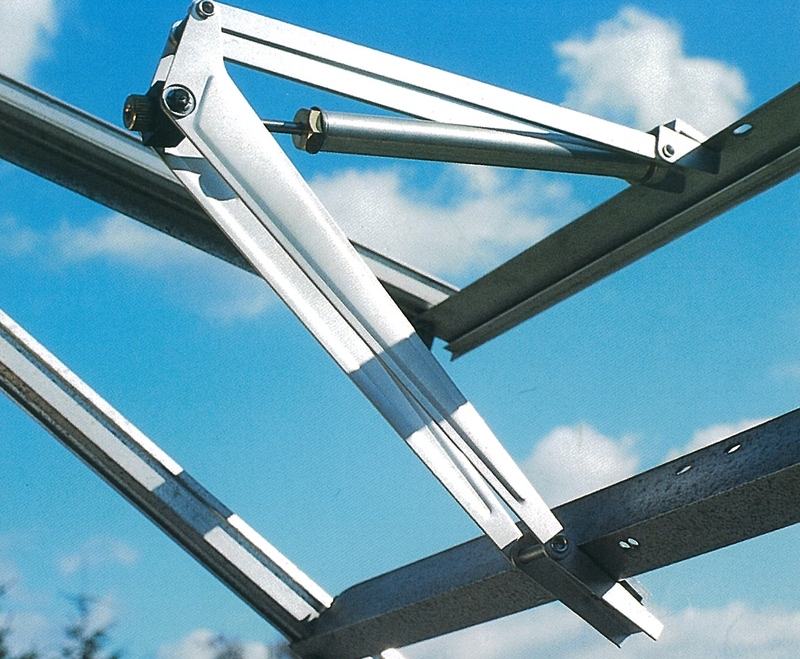 We provide a wide range of widths for recovering existing Hobby Polytunnels. 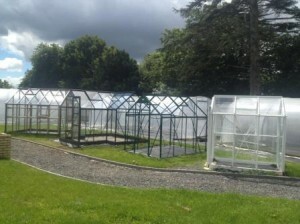 All our Garden Polytunnels and our wide range of ancillary products can be viewed online at our website www.polydome.ie if you have any further queries please ring our Garden Polytunnel team in the office on 057 91 20424 or email to info@polydome.ie . If you get a bucket of warm water and add a small drop of washing up liquid, you will then be able to use a soft brush to clean the tunnel, for the bits you cannot reach get an old bed sheet and with a person each side of the tunnel gently go along the tunnel. Be careful not to do anything that will scratch the cover as this will reduce the light transparency.